A family of Spanish descent, whose arms, according to D'Hozier, were: Argent, a crown bearing the letters "G. F. R." sable, surrounded by two palms sinople, with branches saltire. Members of the Francia family emigrated in the seventeenth century to London, where they became influential and wealthy. The founders of this branch were Simon Francia, (c. 1677) and Domingo Roderigues (Roiz) Francia, died 1688. 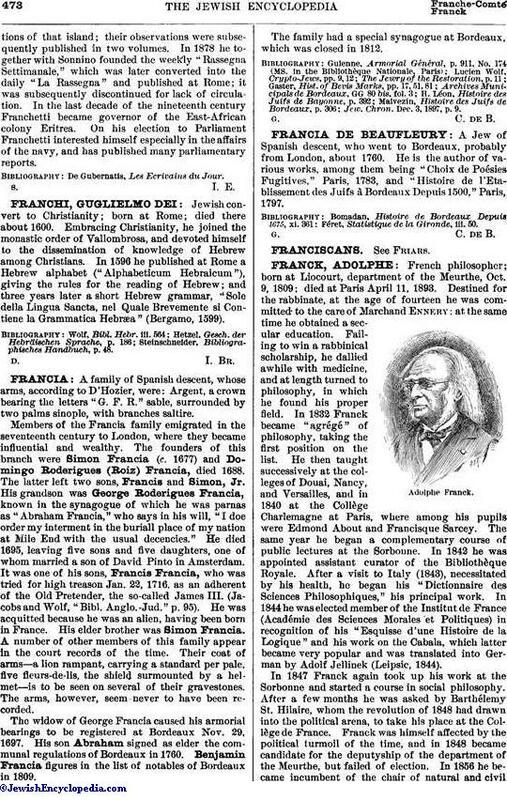 The latter left two sons, Francis and Simon, Jr. His grandson was George Roderigues Francia, known in the synagogue of which he was parnas as "Abraham Francia," who says in his will, "I doe order my interment in the buriall place of my nation at Mile End with the usual decencies." He died 1695, leaving five sons and five daughters, one of whom married a son of David Pinto in Amsterdam. It was one of his sons, Francis Francia, who was tried for high treason Jan. 22, 1716, as an adherent of the Old Pretender, the so-called James III. (Jacobs and Wolf, "Bibl. Anglo. Jud." p. 95). He was acquitted because he was an alien, having been born in France. His elder brother was Simon Francia. A number of other members of this family appear in the court records of the time. Their coat of arms—a lion rampant, carrying a standard per pale, five fleurs-de-lis, the shield surmounted by a helmet—is to be seen on several of their gravestones. The arms, however, seem never to have been recorded. The widow of George Francia caused his armorial bearings to be registered at Bordeaux Nov. 29, 1697. His son Abraham signed as elder the communal regulations of Bordeaux in 1760. Benjamin Francia figures in the list of notables of Bordeaux in 1809. The family had a special synagogue at Bordeaux, which was closed in 1812. Jew. Chron. Dec. 3, 1897, p. 9.